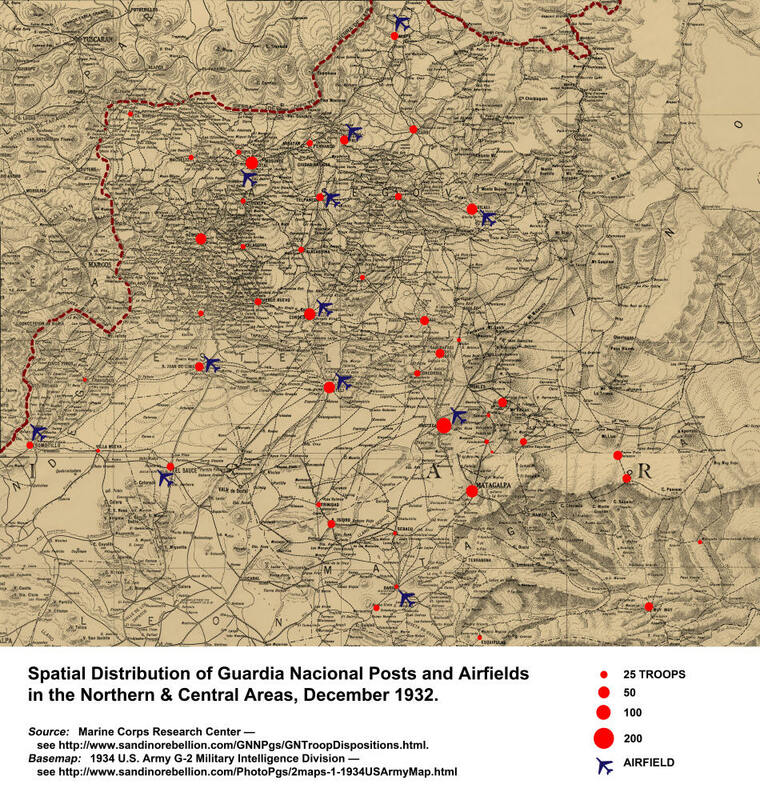 This page offers access to tables summarizing the geographic & numerical distribution of Guardia Nacional troops over time — right now, 15 PDF documents comprising 268 pages of text, covering the period from December 1931 to April 1935. These will soon be accompanied by additional reports covering the period from the Guardia's founding in May 1927. These serial lists provide much valuable information about the asymmetric geographic distribution of the military arm of the Nicaraguan state during its most dynamic and formative period. Where the Guardia decided to deploy its limited resources says a great deal about where the US military and US policymakers — and after late 1932, the Guardia's Jefe Director Anastasio Somoza Garcia and his allies — saw greater & lesser threats, and shows the state's understanding of the geography of Nicaragua's military space and of actual & potential organized social unrest. At the bottom of the page, that military space is mapped out for the Central & Northern Areas using the data in one of these reports (December 1932). I thank Annette D. Amerman of the Marine Corps History Division for generously sending me digital copies of the first 13 of these reports. The following map depicts the spatial distribution of Guardia troops in the Northern & Central Areas, using data from December 1932, above. Click on this thumbnail for a higher resolution image of the same map (JPEG file, 18 MB).